Happy New Year! 2019 is going to be a great year! There are so many different wood turning skill I have yet to master. I have recently gotten into turning lidded boxes. Spheres are another challenge that I expect to take on. I may also get more into carving the bowls. Julie has done a fantastic job of burning artistic designs so I have been reluctant to try carving. Look for the new designs coming in 2019! 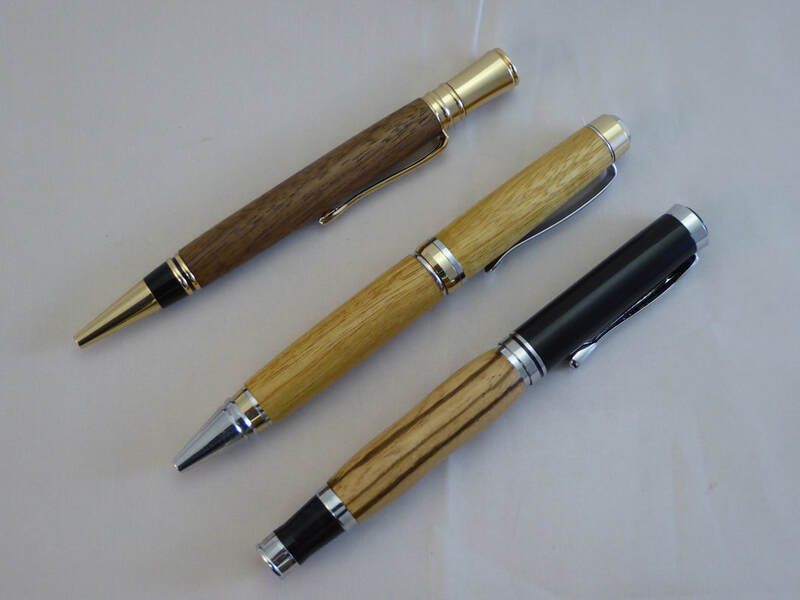 The photos below show some of my recent turnings. I turned quite a few new small bowls because I get instant gratification, or at least I finish them much faster than large bowls. There are many new large bowls, too! You can see more by clicking on the link below. Take a look at all of my new creations! PLATTERS are something new that we are working on. The 12" black locust platter and the 24" oak wine barrel top serving tray are two items Julie decided to burn. Her creative ideas coupled with her artistic skills never cease to amaze me. Either one of these platters can be purchased as a tray or as a lazy Susan. Your call. No extra cost. Finally, I have been getting some orders for custom items. I love making things for friends! However, it does slow down the new items I can add to my website. Still, many new items have been added in the past 2-3 months. 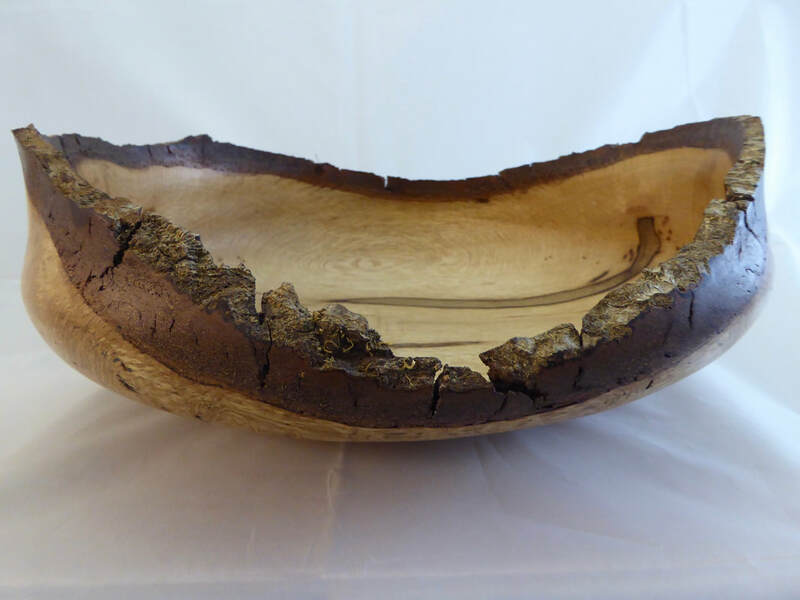 If you have not browsed through the many bowls and gift items in a while you will see new and interesting creations never seen before - LIKE THE LARGE NATURAL EDGE OAK BOWL BELOW! Happy shopping! You can now search for that special bowl or gift item by price, type of wood, or bowl size; or choose to view the newest additions to my collection. Use the button on the left or tab at top. We continue to turn out (pun intended) more wonderful items. 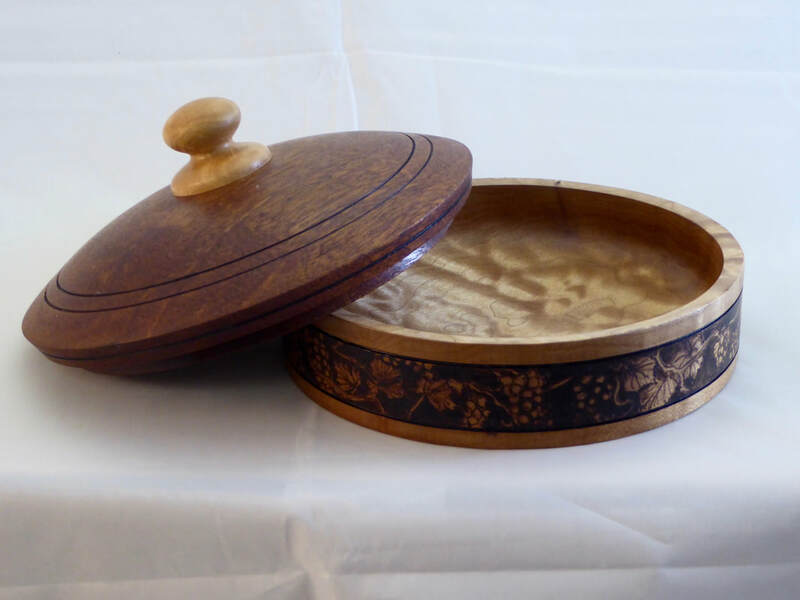 In addition to bowls we are now doing lidded boxes and other useful kitchen items. The expanded GIFT section will continue to grow as we have obtained some amazing rare hardwoods. Look for monthly additions to the GIFTS section! We have PENS; BOTTLE OPENERS; PIZZA CUTTERS; BOTTLE STOPPERS; and BBQ FLIPPERS. Artwork by niece Emily Nix : her interpretation of one of Mike's bowls. 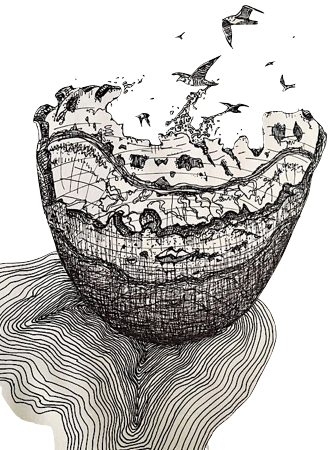 Click the image to see the artwork and the original bowl, now in a private collection. Small bowls and pizza cutters made from more exotic woods. The bowls range in size from 2 1/2" in diameter up to 4 1/2". 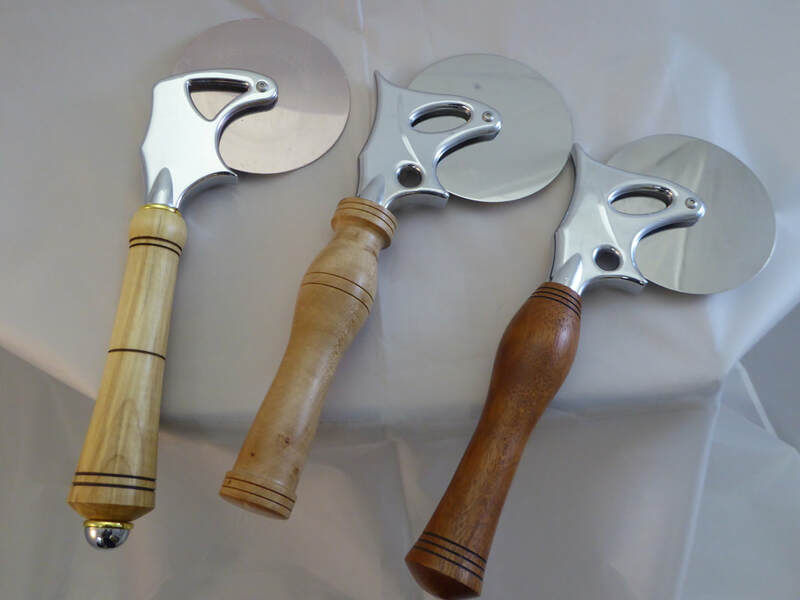 Some of the pizza cutter handles are made from Madrone, Mahogany, Black Acacia, and Walnut. ​When cutting the wood for turning large bowls you end up with many smaller pieces of interesting wood. I have been having fun making smaller items from the pieces that have dried over the past few years or exotic wood I have purchased. Wood for making pens must be interesting and DRY. I purchase most of my pen blanks to ensure these qualities are present. 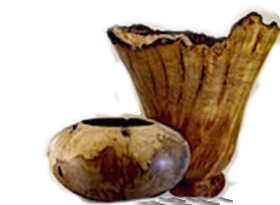 Lidded boxes are another project where fully dried wood is critical. Even then, I have found that the wood moves a bit after you finish the box. I try to keep the wood around for a while to ensure a reasonably tight and consistent fit.